Two local estate agents have been rewarded for being top achievers at the agency PropertyTime. 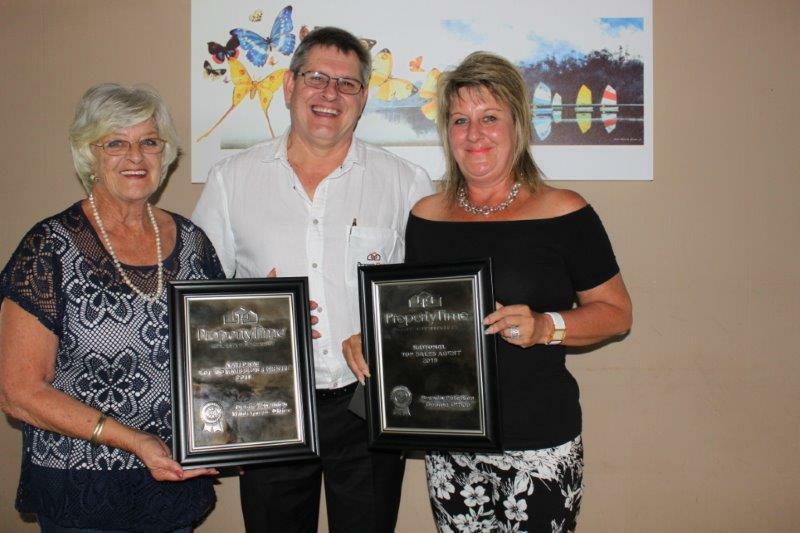 At a special awards lunch at Salinas beach restaurant, Brenda Peterson (George) and Desirè Zwahlen (Wilderness) were presented with pewter plaques by Pierre Roussau, founder and director of PropertyTime. Peterson was voted national top agent for most sales, and Zwahlen national top commissioner earner for 2018. Both agents achieved the same awards in 2016. Says Rousseau, "PropertyTime gives recognition to its top achievers on a national level. To achieve this reward, the agents pull out all the stops, often having to burn the midnight oil. "We as a company are proud to have the calibre of Brenda and Desiré in the ranks, as well as many in the wings on the Garden Route, giving it their best shot. "At the end of the day, it's all about offering a service of excellence to both buyer and seller. Added to this incentive is PropertyTime's involvement in charity work. Some of the agents donate a percentage of their commission to a worthwhile cause", says Rousseau. This year the charity drawn from carefully selected groups is Options Centre (Youth for Christ) based in George. A cheque for R10 000 was handed to Laurie Edwall during the lunch. The owner of RandTransfers.com, Willem van Rensburg, also donated generously towards the R10 000.00 for Options. He also sponsored the lunch. Says Laurie Edwall of Options, "We gratefully receive this generous donation, and thank the selfless agents of PropertyTime, as well as RandTransfers.com for their kind generosity. "YFC Options Care Centre focuses on reaching out to people in our community who are facing a pregnancy or HIV crisis. Through testing, counselling and support we are concerned for the physical, emotional and spiritual needs of the people we connect with. "All our services are free of charge, so donations from PropertyTime and RandTransfers.com are deeply appreciated".